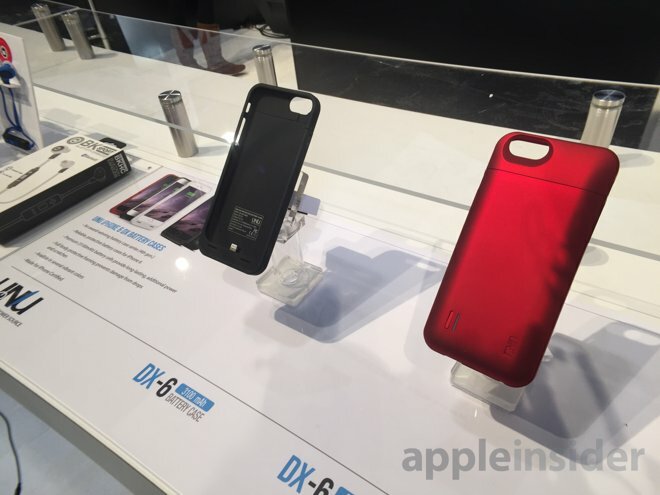 With the first official day of CES in the books, AppleInsider offers a roundup of the best new products we spotted at the annual consumer electronics event that tap into the Apple ecosystem. Perhaps most noteworthy for owners of Apple's new iPhone 6 and iPhone 6 Plus were the arrival of Made for iPhone certified battery cases. The new Apple-licensed protective cases include Lightning connectors and integrated batteries, providing users with more juice on the go. Leading the pack was Mophie, well known for its Juice Pack cases. It announced a new $99.95 Juice Pack Air for iPhone 6 that doubles battery life, a $119.95 Juice Pack Plus model with 120 percent boost, and the $99.95 Juice Pack for iPhone 6 Plus offering 60 percent more power. Otterbox also unveiled a version of its Resurgence Power Case series that will double iPhone 6 battery life for $99.95. And for those looking for a more affordable option, AppleInsider also spotted My uNu's new Made for iPhone 6 lineup, starting at $59.99 for a 2,400mAh battery case, while a 3,000mAh model runs $79.99. Unsurprisingly, wearable devices compatible with Apple's iOS ecosystem are in abundance at this year's CES. One of the more interesting innovations seen by AppleInsider on the show floor was the fashion-focused Swarovski Shine from Misfit. Misfit's collaboration with jewelry maker Swarovski has resulted in two distinct models featuring a large, faceted Swarovski crystal face in either clear or violet. The violet variant comes with solar charging capabilities that all but eliminate the need for plugging in. By placing the specially designed Swarovski "energy crystal" on the Misfit Shine's front face, it can gather light and convert it into electricity with an onboard solar array. Misfit claims its method is highly efficient, requiring just 15 minutes of sunlight for a full recharge. The wearable, waterproof devices track movement data using onboard sensors, allowing for step, fitness, and sleep tracking. Swarovski Shine is scheduled to launch this spring at a starting price of $169.99 for the basic version, while the solar-powered violet version will debut in mid-2015 for an undisclosed sum. 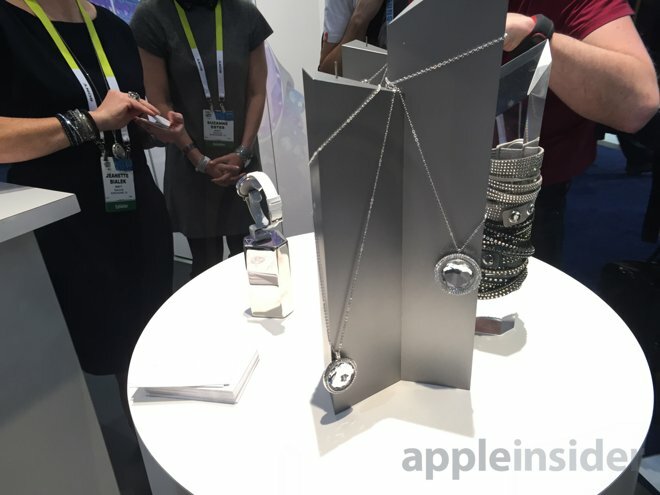 Other wearable devices spied by AppleInsider at CES day one included an updated Basis Peak with iOS notification support, Magellan Echo Fit sports watch with 8-month battery life, and the next-generation Narrative Clip 2 "life cam" for capturing everything throughout your day. 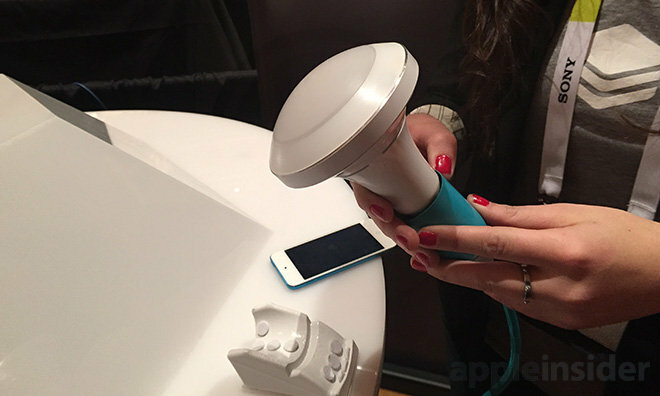 The Stack Lighting Alpha is a HomeKit-connected smart, automated lightbulb. Finally, smart home accessories are also a big focus at CES this year, and many products unsurprisingly tap into Apple's HomeKit functionality baked into iOS 8. In particular, HomeKit was a major focus at the ShowStoppers @ CES event held Tuesday evening, where startups showed off a range of "Internet of Things" solutions for connected homes. HomeKit products at the mini-expo show included the Stack Lighting Alba, a "responsive lightbulb" including motion and ambient light sensors that learns to turn itself on and off, and adjust brightness and shift colors according to preset variables and normal usage patterns. While HomeKit support is not yet available, the company said it is in the works for a future update. Schlage also introduced its new Sense smart lock, a HomeKit-compatible keyless lock that lets owners control and manage up to 30 access codes at once. Codes for secure entry can be entered on the device's built-in touchscreen when the product launches later in 2015, though pricing hasn't been announced. There's also the Insteon Hub, which lets iOS device owners control Insteon switches, outlets, thermostats and light bulbs via HomeKit. And the Incipio Direct line of HomeKit compatible accessories include a smart outlet, light bulb adapter, and power strip. HomeKit compatibility allows accessories to be more easily controlled via iPhone, including support for Siri voice commands. Not yet supporting HomeKit, however, is the newly announced Misfit Bolt, an iOS-connected smart lightbulb priced at $49.